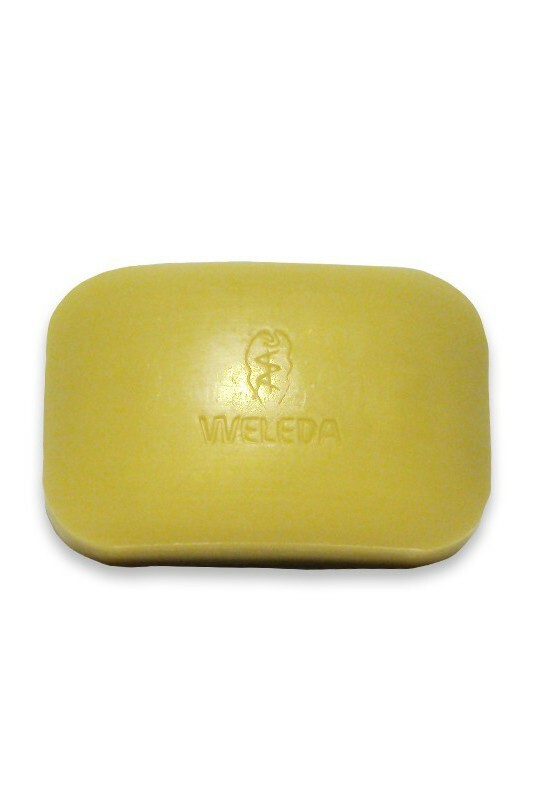 Weleda Calendula Soap is a lightly fragrant, moisture-balancing bar that’s perfect for your sensitive skins, even for babies. This all natural soap contains extracts from nature to soothe and moisturize. Weleda Calendula Soap is formulated with Biodynamic and organic calendula flower extract and organic chamomile flower extract to soothe your skin and render it soft and supple. Biodynamic iris root extract in this all natural soap balances the essential moisture of your delicate skin. Your skin feels supple and soft to the touch after bathing with Weleda Calendula Soap, with balanced moisture that makes all the difference. Because moisture is not something you want to come out in the wash ! très bon produit, je m'en sers même pour le visage. Je trouve ça juste dommage de trouver de l'huile de palme dans un produit bio...à moins que celle-ci soit issue de cultures renouvelables. 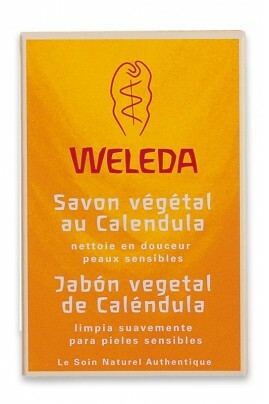 Apply Weleda Calendula Soap to your wet hands or a wash cloth. Wash your hands and/or body and rinse with clean water. Sodium Palmate, Sodium Cocoate, Water (Aqua), Sodium Olivate, Glycerin, Fragrance (Parfum)*, Limonene*, Linalool*, Citronellol*, Geraniol*, Calendula Officinalis Flower Extract, Chamomilla Recutita Matricaria (Chamomile) Extract, Iris Germanica Root Extract, Viola Tricolor (Pansy) Extract, Oryza Sativa (Rice) Extract, Malt Extract, Sodium Chloride (Salt). Odeur très agréable, savon doux, parfait pour toute la famille. L'odeur est juste géniale ! Le savon est très doux avec la peau ! J'adore !! !